Anyone who has ever seen Martin Scorsese's vastly underrated Kundun has a basic knowledge of the beautiful mysteries that drive the religion of Buddhism. It is not necessarily a world that is easily accessible to outsiders. Buddhism is a religion steeped in tradition and mysticism that can seem very strange and even alienating to Western eyes, but in Unmistaken Child, the new documentary by Israeli director Nati Baratz, we get a revealing and unprecedented look behind the scenes at some of Buddhism's most sacred rites. 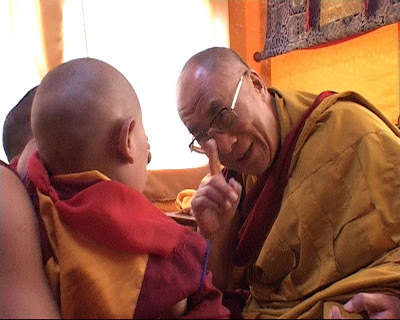 The idea of reincarnation is central to the Buddhist faith, so when Lama Konchog, a deeply revered and highly respected monk, passes away at the age of 84, his young disciple, Tenzin Zopa, sets out to find his reincarnation - the "unmistaken child" that is unquestionably the return of Lama Konchog's spirit to Earth. Tenzin Zopa's quest leads him into the rural villages of Tibet, searching for a child whose birth fell after the death of Lama Konchong. It is a grueling journey, guided by astrology and faith and marked by one dead end after another, until at last one young candidate meets the desired qualifications. Discovering a likely candidate, however, is only the beginning of the journey. From there, Tenzin's young protege must undergo a series of tests to determine whether or not he is the reincarnation of Lama Konchong. He will be faced with many challenges on a path that will take him to the Dalai Lama himself, and if he succeeds, he will face being separated from his parents on the path to enlightenment, as he devotes his life to the quiet study of Buddhism. Baratz directs the film almost like a narrative feature. It is free of the usual talking heads that have come to be associated with documentaries. Instead, it simply follows the journey, taking the audience along as a casual observer - a witness to an ancient and sacred ritual that is both disarmingly beautiful and truly unforgettable. I've said it before, but it's worth repeating - the best documentaries transport their audiences into new worlds, with an immediacy that a narrative film could never hope to achieve. Unmistaken Child is one such film. It is almost a religious experience in and of itself, one that touches the heart and stirs the soul. Baratz brilliantly crafts his film so that it never actually feels like a documentary, it feels like a living, breathing story - an epic journey that has all the ingredients of any Hollywood blockbuster - suspense, emotion, heartbreak, and ultimately, joy. This is masterful documentary filmmaking, chronicling a once in a lifetime event with great sensitivity and pathos. There is a great and powerful beauty at work here, something almost imperceptibly beyond the tangible. What Baratz captures here is nothing short of incredible. Unmistaken Child is a wonderful and wholly unique experience that transcends mere cinema and achieves something far grander and more special. This is vibrant and extraordinary filmaking, a compelling and unforgettable look at an ancient rite that is at once intimate and breathaking. This is what documentaries are all about. 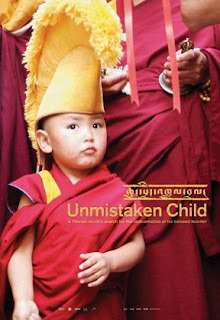 UNMISTAKEN CHILD: Directed by Nati Baratz; Not Rated; Opens tomorrow, 6/3, at the Film Forum in Manhattan.